Top chefs and cooking experts, including Giada De Laurentiis, Adam Richman and Sunny Anderson, reveal their favorite grocery store finds. Think all big chefs insist on making their barbecue sauces from scratch? Think again. TODAY Food talked to some of the country's top chefs and cooking experts, including Giada De Laurentiis, Lawrence Page, Adam Richman, Ryan Scott and Sunny Anderson, who revealed the store-bought sauces and other barbecuing condiments they rely on when it's time to fire up their grills. Their favorites include classic, smoky sauces, along with surprising ingredients for amping up the flavors in grilled foods. You'll want to try them all! Just because she's Italian, doesn't mean she doesn't love a good cookout! Giada De Laurentiis is a fan of Stubb's, a classic Texas-style barbecue sauce developed by one of the most famous pitmasters of all time: C.B. Stubblefield. De Laurentiis says the sauce's flavor is the "perfect balance of sweet and tangy with just a touch of warmth so everyone in the family can enjoy it." Plus, she added, "It's so versatile I even use it in on eggs in the morning." 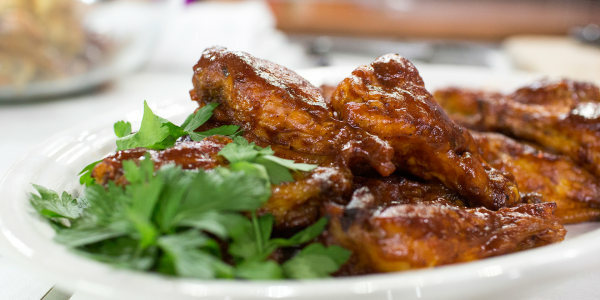 "For quick grilling at home, my go-to sauce is Sweet Baby Ray's Original recipe," said chef Lawrence Page of WE tv's "Hustle & Soul" and owner of The Pink Tea Cup in Brooklyn, New York. "I like the fact that the sauce is sweet, hence the name, and doesn't have a heavy ketchup-like taste. For every cup of Sweet Baby Ray's, I add two pinches of cayenne pepper, 1/4 cup Kentucky bourbon, 1 teaspoon ground white pepper and 1 teaspoon of dark Vermont maple syrup. The maple syrup really adds a nice sweet and smoky flavor to ribs when grilling!" Sunny Anderson prefers to make her own barbecue sauce from scratch, she told TODAY Food, noting that it can be as simple as her 1-2-3 BBQ Sauce with just three ingredients or gussied up with surprising ingredients like blueberries. "Because I like making sauce, I rarely buy it and only do if I find a unique label, kind of like wine," she added. But, she does have a secret barbecue ingredient: "One thing I will suggest for kicking up any BBQ sauce is liquid smoke," she says. "Especially for things that you don't grill for an extended period of time, like fish or veggies, but still want to impart outdoorsy flavor. I've used it since I was in an apartment with a no-grill policy. I used it in marinades and sauces to give that realistic charcoal grill kick. Back then there were just a few flavors like hickory or mesquite, but now there are great flavors like pecan, apple and maple wood. I find Wright's and Colgin brands to be the most pungent and creative with flavors. The key is to not use too much, just a teaspoon or so is good enough for two cups of sauce or adding to marinade/brine for a whole chicken." "I am a big fan of the spicy sauce from Mean Pig in Cabot, Arkansas," said Adam Richman, TV personality and author of "Straight Up Tasty." "With the Mean Pig BBQ sauce, I love that there is heat, but not too much. I like that the flavor develops as you cook with it, and that it can be a base for other sauces by the small addition of things like roasted garlic, sautéed onions, red wine or even oyster sauce," he added. In addition to Mean Pig, Adam Richman says he's a fan of Stubb's, "good ol' Sriracha," and anything that Soy Vay makes. You can sample several of the company's offerings with this variety pack. While Andrew Zimmern, four-time James Beard Award-winning TV personality, chef, writer and teacher, says he doesn't use many store-bought products for grilling, he told TODAY Food that he loves "Daddy Sam’s BBQ Sauce for conventional store bought; I think it’s the best." Andrew Zimmern calls this mustard-based sauce from Buxton Hall "beyond superb." He buys it from them online. "One of my secret weapons [for grilling] is Bulldog, a Japanese brand of tonkatsu sauce. Thinned out with a few tablespoons of vinegar, it’s a superb marinade and I use it as a table sauce loosened with lemon juice all the time," said Zimmern. "The sweet and savory combination in Bulldog isn’t a steak sauce or Worcestershire sauce, but it's vaguely reminiscent of both but jammier and fruitier. 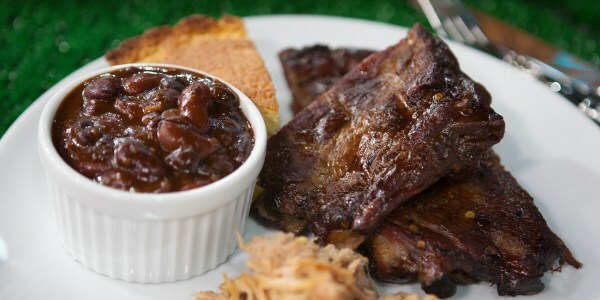 Glazed on ribs, it is phenomenal." When it comes to sauces for grilling, TODAY Show regular Ryan Scott thinks outside of the traditional bottle of sauce. "Tunisian harissa is a great marinade [for grilled meats]," he said. "It can be used as a sauce but should be used sparingly as it is pretty strong." Scott also said this chipotle salsa is a go-to for grilling season: He uses it both as a marinade and a condiment. While you might have thought of serving kimchi alongside grilled food, Scott has a brilliant use for the juice from the package: He uses it as a marinade. Scott likes Trader Joe's kimchi, which is not available online, so we've included a link to a top rated kimchi on Amazon.